The trail up Pu’u Wa’awa’a passes through old ranch land, some of which is still used for livestock. Part way up, near the old quarry, is a small, flat-roofed building made with concrete blocks. This could have been a home for a ranch worker or perhaps a basic office associated with the quarry. Whatever it was, it no longer is. The building is gutted, the doors and windows gone. Nowadays it serves as a shelter for sheep, goats, cattle and whatever else wanders in. One things it still has is a commanding view of the Kona coast. 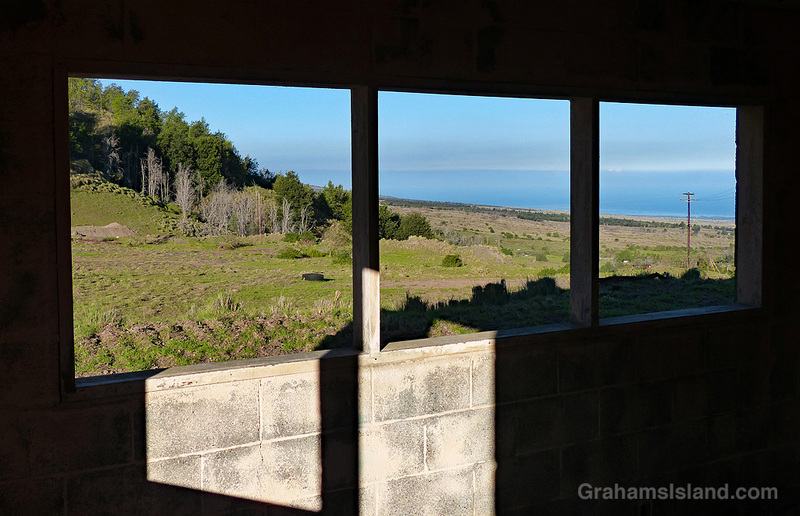 These old windows look out onto the side of the hill and down toward the coast in the distance. For more information about Pu’u Wa’awa’a and its trails, go to puuwaawaa.org.